After 3 CDs does it get easier? You bet, there's nothing like the creative process and sharing it with others. Check out her website at www.nicolagordon.com. The recorded sounds on this CD are pristine. The vocals and harmonies are beautiful and the writing shows Nicola's keen powers of observation from someone with hands on life experience. 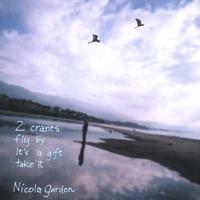 Nicola Gordon's latest CD "2 cranes" is a delicious collection of intelligent heartfelt songs. Detailed images backed up by real emotional clout make this release a standout and repeated listenings a joy. Beautifully performed, expertly produced and harmonies to die for. A rare gift indeed! I'll take it! Do not miss or underestimate this magical third CD from Nicola Gordon. The songs, all original, are variously pointed, soothing, sharp, funny, profound, profane and simply beautiful. Melodies and multi-layered lyrics are finely woven and memorable. At least 3 (More Love, Unlikely Angel, Keeps Comin' Back) could become classics of the poetic folk/ rock genre. The song sequence on the CD progresses from emotional nakedness to a spiritual peace that reminds us why we all need more songs like this. Been running around outta town lately, but wanted to say how much I enjoyed and admired your new album. Another fine job, full of truth and wisdom and pretty turns and winky quirks... great stuff!